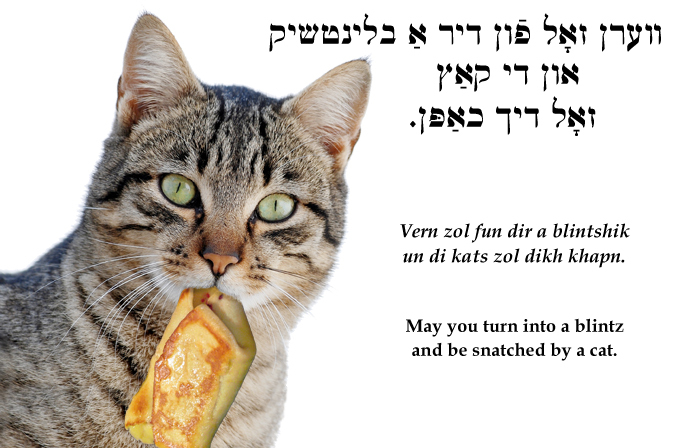 Yiddish Curse: May you turn into a blintz and be snatched by a cat. ווערן זאָל פֿון דיר אַ בלינטשיק און די קאַץ זאָל דיך כאַפּן. May you turn into a blintz and be snatched by a cat. er zol dikh oyfesn un mit dir zikh dervergn, volt men fun aykh beydn poter gevorn. may he eat you and choke on you so we'd be rid of you both.